ISTANBUL (AP) — Recep Tayyip Erdogan has held plenty of grand opening ceremonies in his 15 years at Turkey’s helm. On Monday he will unveil one of his prized jewels — Istanbul New Airport — a megaproject that has been dogged by concerns about labor rights, environmental issues and Turkey’s weakening economy. Erdogan is opening what he claims will eventually become the world’s largest air transport hub on the 95th anniversary of Turkey’s establishment as a republic. It’s a symbolic launch, as only limited flights will begin days later and a full move won’t take place until the end of the year. Tens of thousands of workers have been scrambling to finish the airport to meet Erdogan’s Oct. 29 deadline. Protests in September over poor working conditions and dozens of construction deaths have highlighted the human cost of the project. “This airport is going to be the most important hub between Asia and Europe,” Kadri Samsunlu, head of the 5-company consortium Istanbul Grand Airport, told reporters Thursday. Turkey’s Ministry of Labor has denied media reports about hundreds of airport construction deaths, saying in February that 27 workers had died at the site due to “health problems and traffic accidents.” It has not commented since then. Megaprojects in northern Istanbul like the airport, the third bridge connecting Istanbul’s Asian and European shores and Erdogan’s yet-to-start plans for a man-made canal parallel to the Bosporus strait are also impacting the environment. The environmental group Northern Forests Defense said the new airport has destroyed forests, wetlands and coastal sand dunes and threatens biodiversity. These projects are spurring additional construction of transportation networks, housing and business centers in already overpopulated Istanbul, where more than 15 million people live. 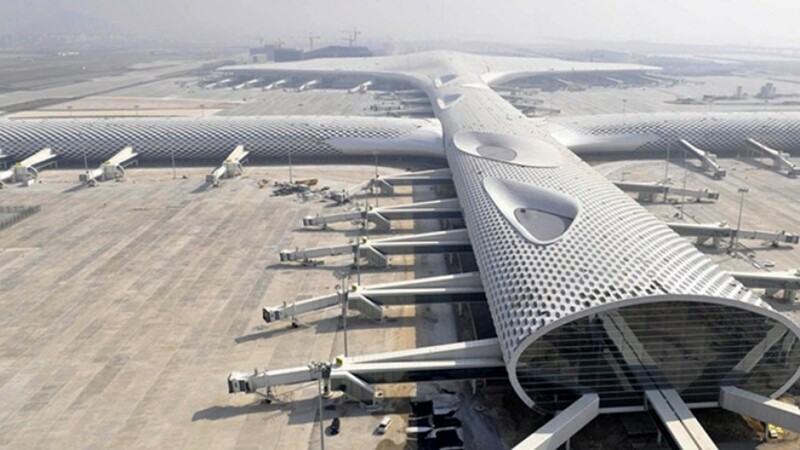 Samsunlu, the airport executive, said an “airport city” for innovation and technology would also be built. Financial observers say lending has fueled much of Turkey’s growth and its construction boom, leaving the private sector with a huge $200 billion debt. With inflation and unemployment in Turkey at double digits and a national currency that has lost as much as 40 percent of its value against the dollar this year, economists say Turkey is clearly facing an economic downturn.